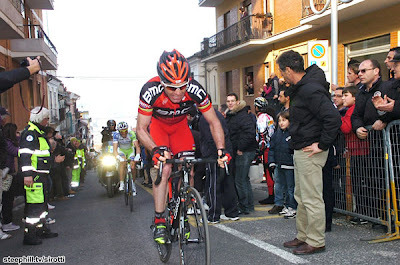 This morning, I woke up to catch the shenanigans of stage 4 in Tirreno Adriatico. I thought I would do myself a favor and wake up early (6:30 AM) to take it all in. I miss timed it & was too late. No matter, I was further inspired with the twitter message from Cillian (irishpeloton), "You missed a great stage finish." I finally had the chance to watch the last 8 kms off YouTube and I saw a fantastic race to the finish in the village of Chieti. Looking rather intimidating, Michele Scarponi attacked with 2 kms left and pulled away in his patented attack to score an impressive victory (he won the same stage last year). Not bad for a guy who has only six days of racing so far this season. I'm sure he's looking for revenge from last year's race where he lost valuable intermediate sprints points to winner, Stefano Garzelli. I'm liking how Cadel Evans seems to always be in the mix. He attacked and put in a great challenge but finished a strong third behind the Little Prince is back, Damiano Cunego. The race turns interesting with new blue jersey holder, Robert Gesink in the precarious lead. Evans is second (10 secs) & Scarponi slots in third (25 secs). Tomorrow's stage will be another 240 kms and more excitement is in store. Now, I'll have to remember the time change not to miss it. I sure as hell do not want to be late for this one!